Right now, people in Tokyo are celebrating the cherry blossom at their best. The blossoms came suddenly this year. People are getting the fidgets during work time because they are worried about whether the best condition holds until the weekend. Some have already started enjoying Hanami party. 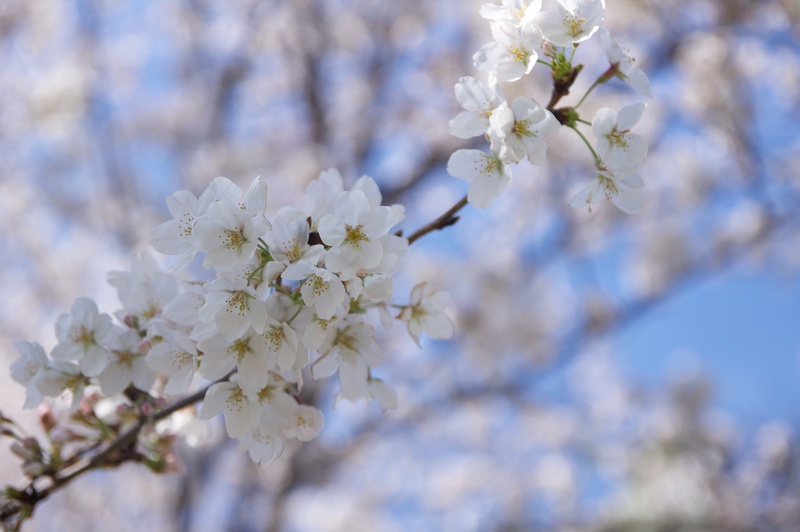 In literal translation, Hanami means “watching flowers” but it usually means a kind of party where you get together with your friends or co-workers under cherry trees and have drinks and foods while enjoying the blossoms. Because Japanese people love cherry blossom so much, records of the cherry blossoms have been kept well. 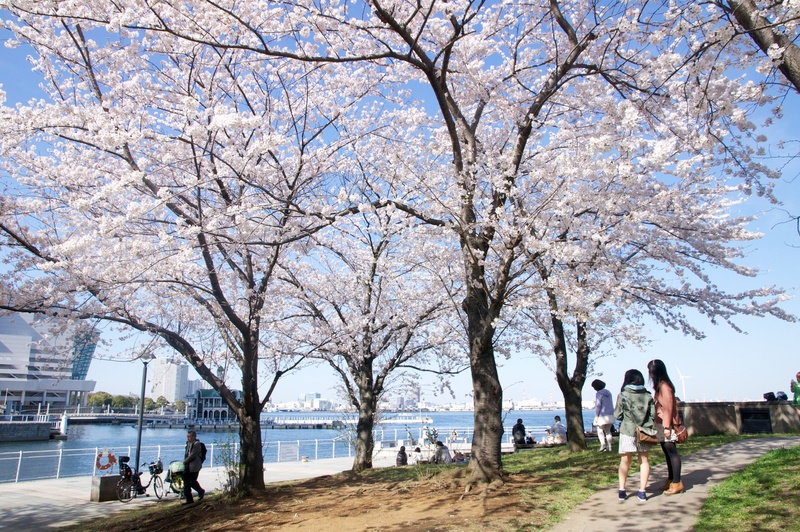 Also, the main factor for cherry blossom is known to be the temperature, which makes the cherry blossom a good indicator of tracking the effect of climate change. 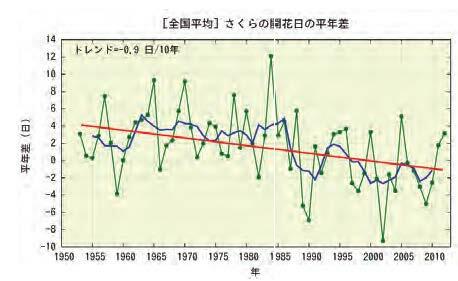 According to Japan Meteorological Agency’s report, the timing of cherry blossom has become earlier at the pace of 0.9 day per decade since 1953. The latest version of the report is 2012 in Japanese but the 2011 version is available in English here. One might wonder why it is so important. After all, it does not mean you cannot see the cherry blossom; it just means it is going to be a bit early. This is where Japanese custom/culture comes in. In Japan, most of the schools and workplaces start their (fiscal) year from April and end in March. Because of this, April is a season where new lives begin and the cherry blossoms are considered a symbol of new lives. However, if the timing shifted toward earlier, then it suddenly changes its meaning. Now it is not very uncommon to see the cherry blossom in the season of graduation ceremony, i.e. end of one stage of lives. This could completely change the meaning that our culture gives to the cherry blossom. You might still think that is not a big deal. After all, it is not as harsh as other examples of climate change, e.g. extreme weather events or sea-level rise. I think that’s a fair point. What scares me, though, is that this is a typical,example of climate change’s impacts going beyond physical, tangible effects. It could change intangibles too. Here, it is the meaning of the cherry blossom that people give in our culture. To me, this is a scary example of complex climate change impacts. What bothers me further is that people, including, or, especially, me, are getting more and more detached from nature and are becoming insensitive to those signs that we could have gotten much earlier. On the cherry blossoms, yes, even I feel the change. But we are losing the touch of nature and becoming poor at feeling how seriously it is changing. This could slow us down in terms of actions that we must take. This may not be the case for those who still work close by nature but those who live and work in urban areas, it may be a big problem, because, as the IPCC report shows, we don’t have much time left.